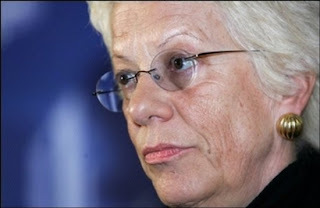 Carla Del Ponte in a conversation for the Slovenian Ljubljana Dnevnik expressed that she was against giving in to Serbia in its integration process. “Milosevic, Karadzic and Mladic are the most responsible for the crimes committed in the former Yugoslavia… Restarting negotiations (with Serbia) would be a very poor message for Belgrade. Without the arrest of Karadzic and Mladic, without total cooperation with the Court, it would be the wrong idea” said Chief UN War Crimes Prosecutor Carla Del Ponte in the conversation. “Until it resolves (its own) war crimes and until it stops treating them as heroes, Serbia does not have the intelligence to enter the EU. They do not have the manners to enter the EU” - said Carla Del Ponte. She added that she was very critical of the thoughts of the Slovenian minister of foreign affairs, Dimitri Rupel, that they should not make too strict criteria for Serbia because it is a country important for stability in the west Balkans. “When I heard your minister talk about restarting the negotiations with Serbia, I was shocked. He knows that is sending false messages. Of course we all want Serbia to enter Europe. Good. However a Serbia that protects war criminals must not take a single step forward. We can not accept that, I think that neither can your minister”, said Del Ponte. She added that she does not even want to think about what will happen if Radovan Karadzic and Ratko Mladic are not arrested by the end of the current open proceedings in the Court. “Mladic and Karadzic need to be arrested this year, if possible before September, whilst I am still here. What if that does not happen? The decision will have to be made by the UN Security Council. If the arrest happens before the Court closes its doors, they will have to extend its mandate. If they are not arrested by 2011, when the appeal proceedings will be closed – and I do not even want to think about that – in that case the UN Security Council would have to make a decision that somebody should give them a trial”, said Del Ponte.